Just a few days more to Christmas! I'm getting excited! Can you tell which one was that?? It was the star shape flaky pastry. 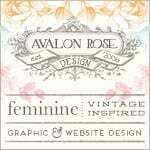 Well, I will be closing my etsy shop during the christmas break. Time to relax a little, do some more research, shopping and learning again! 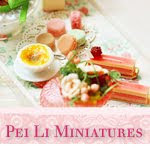 I will be back in Jan, hopefully feeling re-charged and with more new items and ideas for the new year! Wishing all of you a Merry Christmas and wonderful blessed new year! I can't believe Christmas is just going to be a week away...I don't have a habit of gift exchange, but I will be getting 2 presents for close friends. It will be quite easy as I already decided what to get for them. 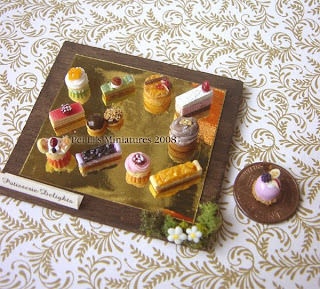 I got this idea when I received a request to have a customized order for a "sampling plate" - meaning one of each of all the patisseries I made in my previous piece. I initially was thinking of the usual display tray, but knowing it was going to be one each, I thought this would be a better way to display it. 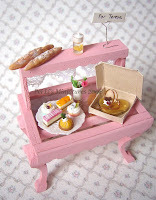 First, I wanted a vintage, elegant wood display to bring out all the pretty patisserie. To soften the look, I added some more faux grass and white pretty flowers. 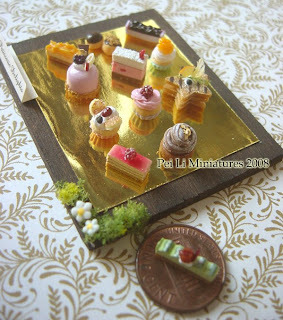 The patisseries are not glued to the piece, so it can be arranged in any way. 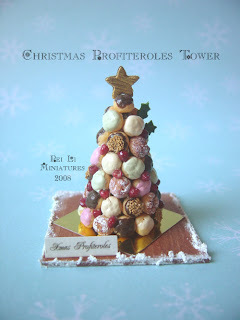 This week was a good week for me, I finished 2 projects and also sold 2 christmas profiteroles tower! I was overjoyed. 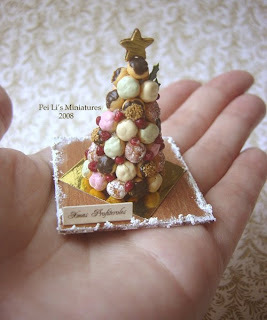 The 1:12 dollhouse miniature profiteroles tower was something I enjoyed making, though a bit time consuming. But it was fun seeing the whole tower forming. 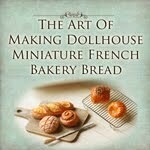 I wanted to show photos of the 1:12 dollhouse miniature double layer cake display shelf I created and finished this week. 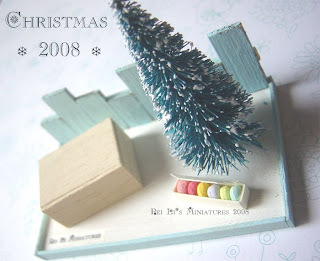 The entire piece was made with the idea to be a window shop display shelf. 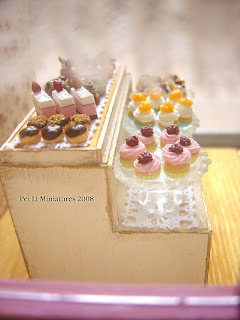 Hence, the patisseries had to be eye catching, colorful and vibrant. 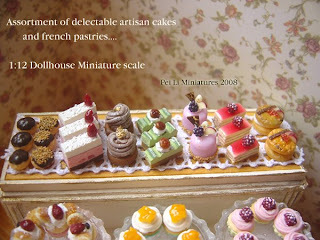 Imagine passerbys walking along and can't help but stop and look at the mouth watering dollhouse miniatures cakes and patisseries. This piece is all about the details. 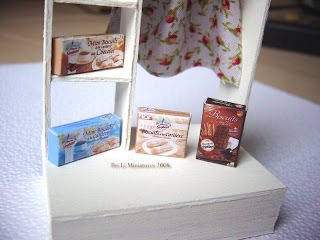 With that, I present you the 1:12 Dollhouse Miniature Double Layer Cake Display Shelf. 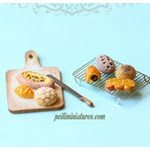 Left to Right : Chocolate profiteroles, chocolate & peanuts profiteroles, strawberry slice mousse cake, chestnut mont blanc, green tea with chestnut slice cake, blackberry delight, framboise slice cake and mixed fruit tarts. Front view of the entire double layer cake display shelf. Bottom shelf are some of my signature cupcakes : Madam Butterfly, Raspberry, Juicy Mango. 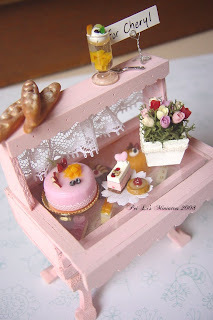 A few weeks ago while shopping during lunch time, I found a perfect gift box for my miniature table piece. The width and length was just nice. It was only $2.00. 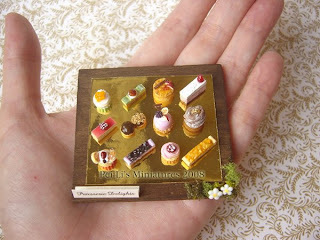 I bought it happily as I knew it would be the best way to display the 1:12 scale miniature gift. I decided to use the flower arrangement for this piece. I like how it looks on the table. 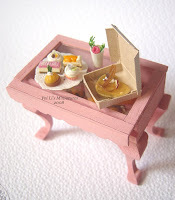 Desserts inside the table. I love the white chocolate swirl on top of the raspberry mousse dessert. 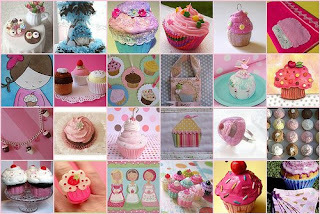 :) Which is your favourite? 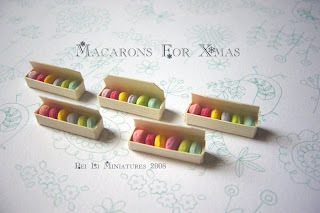 I have been busy making some mini boxes to put in the mini macarons. I think they are cute. 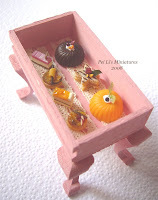 I also want to make some cake boxes to put in slice cakes. 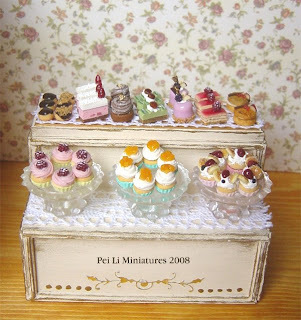 Besides the plates and doilies, they are a perfect way to display cakes. Oh! I have also dosed the 1:12 Miniature Red Door with snow. But for some reason, I felt it wasn't enough. I'm going to put more snow on it. A part of me likes the clean look, so I must admit I was hesitant putting on that first layer of snow! This week, I concentrated on 2 projects. The Red Door and the Dessert Table. I was striving to make something a little different. I made a tiny pot of flower arrangement, which I am very pleased with. 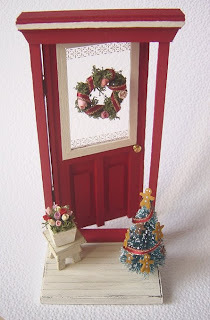 It was meant to be used for the Dessert Table project, but I tried putting it into this scene and it looks great in this Red Door scene as well! I like how the flower arrangement makes the scene look so intricate. Hmm I might consider making another pot for this even though it does take considerable amount of time. 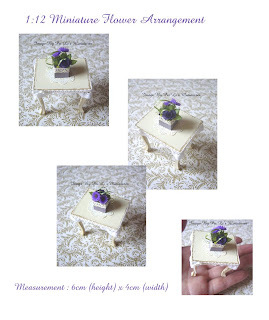 The flower pot measures 1.4cm x 2.5cm(height). 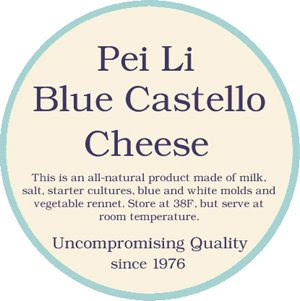 After some of the comments I received last week, I am tempted to try out a red door. And you know what, I might possibly attempt to do a whole loads of other colour doors too! Now, I love red, but red is a very bold colour. To attempt to try it takes a little bit of courage! What shade of red should I even choose? I went to the craft store on Saturday, and after browsing through a whole row of red paint, I finally chose a Cardinal red. My initial choice was Holiday Red (from looking at the internet screen), but you can never buy a colour based on what you see on the computer screen. My gut feel told me to go for Cardinal red, and so I did. I know this project has been cast aside for way too long, but I have finally completed it!!! I like that this piece is easy on the eye and not too complicated. I like how the pretty red vase of flowers brighten up the white chair. Now, I'm wondering what colour door do I want to do next? I want to attempt something a little different in the next piece.